A: Actually you can create any menu you like with Deluxe Menu. 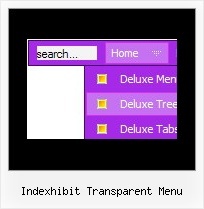 FireFox - when hovering over the Product Info or Samples buttons, the Deluxe Menu flash element disappears behind the drop-down menu. I notice this pages states: "If for some reasons a submenu can't drop down over an object the latter will be hidden for a time when the submenu is shown.". A: Unfortunately, it is really so. Now there is no work around for this. We'll try to fix this bug in the future version of Deluxe Menu. Q: I want to purchase the software using the company credit card, my question is do I get automatically a registration number for immediate use or it will be sent via post mail. I need to use the dhtml menu script right now so the post mail is not an option. A: We do not accept payments directly and use share-it paymentprocessing service. We use ShareIt service to process orders. After the ordering is complete and ShareIt has it verified(which can take approximately 24 hours), you'll get your license info.